Special thanks to BBVA Compass for sponsoring today’s post. Do you suffer from working mom guilt? You need to work but also feel bad that you aren’t around for your kids every single moment they might need you. Let’s face it, if you work and have children, you feel guilty about it. We’re wired as moms to nurture and protect our children. When our time and attention is spent elsewhere, no matter why or how long, we feel like we are failing our duty as mother. So if we’re hard wired to be with our children but need to work (for financial reasons or our own sanity), how do we cope with working mom guilt? As a military wife, it was far easier and better for my family for me to be a stay-at-home mom (SAHM) for many years. I don’t regret one moment of those years even though I had plenty of mom guilt. When you’re the primary caretaker for your children, it’s easy to make mistakes and find the flaws in your parenting. During that time I also knew it was important for me and for my children that I have interests and pursuits outside of being a mother. I wanted to set an example of the type of person I hoped they’d grow to be as adults – charitable, hard-working, healthy, interesting. So, while I was a SAHM, I was also a volunteer, student, and runner. These other areas of my life sometimes pulled me away from my family, just as work does now, and I often felt conflicted about that. Once my kids were all old enough to be in school, I chose a career that would allow me to have flexibility. This way I could still attend field trips, see my kids off to school and greet them at the end of their day, and take time off during the rare times my husband was able to take leave. Even with the amazing flexibility of blogging, I have deadlines to meet, work that can only be done when my family also happens to be home, and travel. I am surprised at all the mom guilt I still have, even though my activities now give back to the family in a very tangible way — income. The reality is, no matter how strongly I feel that it’s okay (good, even) for me to have interests outside of my family, I feel guilty any time one of those interests takes precedence over my family. Meanwhile, I don’t bear any resentment towards my husband for his interests or my kids for theirs. Why do I feel like I’m not entitled to the same things that I applaud my husband and children for pursuing? Where does all this mom guilt come from and how do we overcome it? Before we can overcome mom guilt, we need to understand why we feel guilty for having other interests in the first place. For starters, a lot of it is coming from societal pressure. A majority of Americans believe that children are better off with a parent who stays home full time. As a society we believe moms should be home with the children (presumably tending to their every need). But reality doesn’t allow for that outcome for many of us. The real kicker is that science doesn’t necessarily support this popular belief. 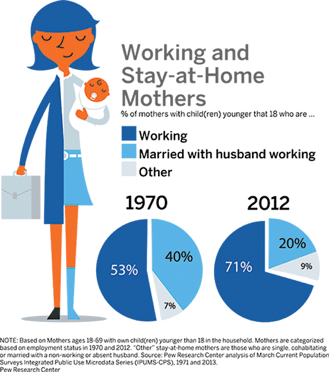 In the book, Mom Guilt, Emma Johnson shares the results of a study that shows modern working moms actually spend as much time with their daughters as the stay-at-home moms did in the 1970’s. Despite the fact that we feel like we need to spend more time with our children, we’ve really gotten quite good at carving out time for them no matter how busy we are. As I already mentioned, genetically we’re programmed to be caretakers. We’re the ones with the biology to create life and produce milk to sustain our babies’ growth (even if you use formula, your body was equipped to supply milk). Our own bodies tell us that as women, our role is to nurture our children. Consider the fact though, that everything you do impacts your child. If you need to work in order to make enough money to pay the bills or to feel satisfied and fulfilled as an individual, tending to those needs is another way to nurture your children. Not only do we have to nourish our children’s physical health, but also their emotional and mental well-being. If working allows you to fulfill those needs better, you have nothing to feel guilty about! Almost everything is easier and more fun when you don’t have to do it alone. If you feel like you are falling short in life, whether it’s at work or at home, recruit some help! Help can come in many different forms. If you’re a working mom, you’ve likely been forced to outsource already. Unless your kids are old enough to take care of themselves or you have a stay-at-home spouse, you’ve had to hire childcare. Child care providers aren’t the only people who can save you time though. You can hire someone to help with keeping your home clean or your lawn manicured. You can sign up for grocery delivery services or subscription boxes that auto-deliver items or clothing at fixed intervals. Better yet, make use of the affordable workers you have living under your roof. Kids can take on many household chores. And depending on your allowance philosophy, they can do so with little to no compensation required. If you can’t afford to outsource, find a team with whom you can share responsibilities. Whether it’s close friends who you can swap babysitting duties for date night with, or a group of parents who can take turns in a carpool, there are lots of opportunities to share or swap duties with other people. One of the critical components of your support team is a good mom squad. This can be as few as one and as many as dozens of women who you relate to. It’s so critical to have at least one fellow mom who can understand your guilt, joy, frustration, anxiety, fear, and excitement. If you can’t find your squad in person, consider online groups. It doesn’t matter what form your squad takes. What’s important is that you have an outlet to ask questions, share your thoughts and opinions, and seek advice and support. Besides your mom squad, you should have a short list of people you admire and want to emulate. You can’t get where you want to go if you haven’t chosen a destination. That’s why it’s important to have an image of what your “ideal” looks like. Seek out role models and mentors who are living the life you imagine for yourself. Then, find out how they did it. 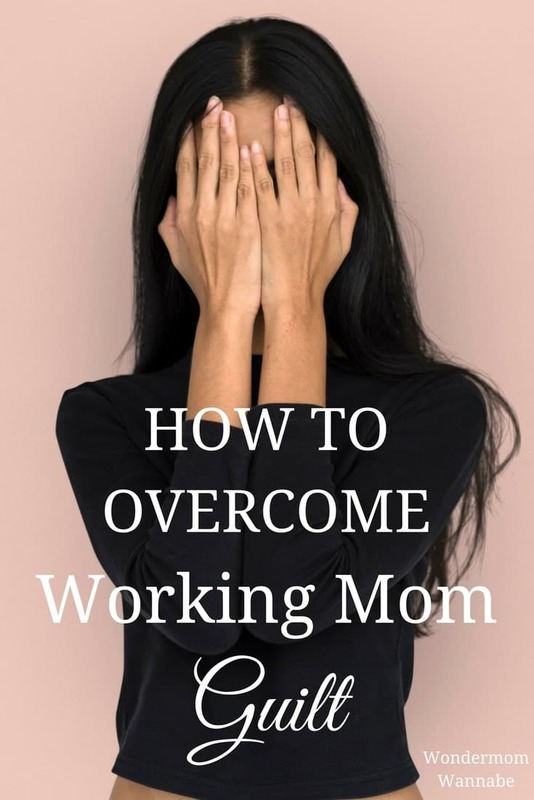 If you download the free Mom Guilt eBook, you’ll find several stories of working moms at different parenting and career stages, sharing how they juggle professional and family life. We’ve already talked about identifying and understanding the source of your mom guilt. Hopefully, when you identified the source, you realized that the guilt you feel is more emotional than logical. Whether you’re working to pay the bills, for personal development, or personal satisfaction, you do it for reasons that make your home life better. So, whatever your reasons are for working, enjoy those benefits! Your other interests matter too. Want to raise good readers? What better way to inspire a love of reading than to model it? Stop feeling guilty about your monthly book club meetings or the time you spend reading at night or on the weekends. You’re setting a good example for your kids that reading is a fun and worthwhile pursuit. If you want your kids to be healthy, that hour you spend at the gym or on a run is a good way to prove that taking care of ourselves is important and worthy of our time. The girls’ night out you enjoy is a good way to teach your kids that it’s important to nurture all their important relationships, not just those with family. If you need help being proud of what you do or you still feel guilty even though you must/want to work, check out the Working Moms Mean Business podcast series on Bright Ideas for Business. The podcasts cover a variety of topics specifically for working moms from child care challenges to the rise of families with female breadwinners. Set boundaries and expectations for both work and home – Block off time for each and create guidelines for exceptions, then stick to them. Set the tone – Don’t apologize for spending time away from your family. Instead, communicate why you’re excited about what you are going to do and why it’s important. Feed all the areas of your life – There’s more to life than work and family. Include more interests for a richer life – health, social time, relaxation. Embrace imperfection – Some of life’s funniest and happiest memories are born out of when things go wrong. Forget trying to be perfect and enjoy the imperfections that make each moment unique. All the podcasts in the series are packed with helpful ideas, tips and inspiration. Download them all and listen to them on your commute, during your workout, or any other time you’d have on background music. It’s an easy way to multitask – ridding yourself of mom guilt while you get something else done too. If you STILL feel racked with working mom guilt after reading all the tips below, please share with me in the comments why. I’m happy to be part of your mom squad and point out what makes you amazing.